Biography and Paintings of French Impressionist Painter. One of the greatest modern paintings. please see: Analysis of Modern Paintings (1800-2000). Pissarro was born, one of six children, to Jewish French-Portuguese parents - Abraham Gabriel Pissarro and Rachel Manzano-Pomie - in St Thomas, in the Virgin Islands. He lived there until he was sent to boarding school in France to complete his education. After finishing his studies, he returned to work in the family general store, while practising drawing in his spare time. And indeed, it wasn't long before he decided to become a full-time artist, except his father vetoed the idea, whereupon Pissarro ran away to South America with his friend, the Danish artist Fritz Melbye. They settled in Caracas, Venezuela, where they set up an artist studio in a move reminiscent of Paul Gauguin's later voyage to Tahiti. Happily, three years later, his father relented, and in 1855 Pissarro travelled to Paris to begin his life as a painter. To begin with, like his fellow Impressionist Edgar Degas, he spent time copying Old Masters in the Louvre, a task which led him to develop a strong admiration for the works of Camille Corot, a member of the French Barbizon school of landscape painting. In 1856, he enrolled at the Academie Suisse and also at the Ecole des Beaux-Arts. The former provided no artistic advice, while the latter's tuition was so uninspired that he approached Corot for informal advice, and later obtained permission to call himself Corot's "pupil" at the Salon exhibition in 1864. Out of all his early contacts, Corot is seen as Pissarro's most important influence, from whom he developed his sense of naturalism and his love of outdoor painting. But in addition to Corot's lyrical pictures, he also developed a liking for the tranquil landscapes of Charles-Francois Daubigny (1817-1878) and the raw imagery of Jean-Francois Millet (1814-75), as well as the down-to-earth realism of Gustave Courbet (1819-77). At the same time, Pissarro was also meeting and making friends with the younger painters - including Claude Monet, Paul Cezanne (1839-1906), and Armand Guillaumin (1841-1927) - with whom he would create the style known as Impressionism. He also became an active participant in discussions at the Cafe Guerbois in Paris, where writers and artists came together to exchange ideas. 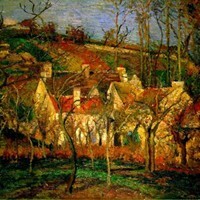 In fact, as far as painting was concerned, Pissarro never stopped assimilating the work of others: indeed, if one were to examine his output for signs of other artists, one would encounter elements borrowed from several Barbizon painters, as well as JMW Turner, Monet, Cezanne, Renoir (1841-1919), Johan Barthold Jongkind (1819-91), and Georges Seurat (1859-1891). For more about the factors that helped to shape Impressionist art, see: Impressionism: Origins and Influences. For details of its evolution, see: Early History of Impressionism. It was around 1860 that Pissarro began to reject conventional political ideas in favour of more left-wing or anarchist-type notions of social organization. Ironically, in his art, he demonstrated a far greater talent for depicting the reality of nature and rural scenery, rather than social realism. Moreover, he was already showing at the Paris Salon. His carefully worked landscape painting of Montmorency had proved sufficiently Corot-esque to be accepted for the 1859 show, and he was again accepted in 1864, 1865, 1866. He also participated in the famous Salon des Refuses, along with Edouard Manet (1832-83) and James Abbott McNeill Whistler (18341903). Examples of his early, typically dark, landscapes include: Chennevieres au bord de la Marne (1864, National Gallery of Scotland); Bord de la Marne en Hiver (1866, Art Institute of Chicago) and L'Hermitage a Pontoise (1867, Wallraf-Richartz Museum, Cologne). 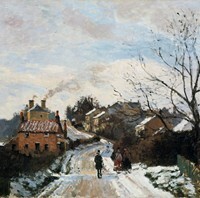 The early 1860s was a particularly eventful time for Pissarro. In 1859 his parents returned to Paris from the West Indies, which significantly improved his living conditions. Then in 1860, he became closely attached to Julie Vellay, his mother's maid - a relationship which led to a miscarriage two years later, before the first of their seven children were born in 1863. Not surprisingly perhaps, his proposed union with a servant-girl did not meet with the approval of his father who threw them both out of the house and cut off his allowance. In 1865, Abraham Pissarro died, triggering a financial crisis for his son, who now had a daughter. 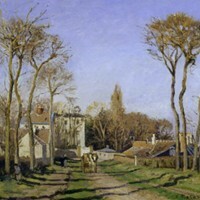 In 1867, Camille Pissarro and his family moved to Pontoise, a village near Auvers, before settling in Louveciennes, some 20 miles outside Paris. During this time he worked constantly outdoors at his landscape painting, while maintaining a studio in Paris, and keeping up his contacts at the Cafe Guerbois. He worked closely with Claude Monet and Alfred Sisley as well as Renoir. Gradually, his palette lightened and he began to paint in the impressionist style, using smaller brushstrokes of vivid colour. However, despite attracting praise from the famous writer Emile Zola, and being an active member of the emerging Impressionist group, lack of money not infrequently forced him to take menial jobs painting postcards and decorating shop fronts. At the end of the war and the fall of the Paris Commune, Pissarro returned to Louveciennes, where he discovered to his horror that only 40 out of his 1,500 paintings had survived - the remaining 1,460 canvases had been destroyed by Prussian soldiers. Undeterred, he carried on painting as actively as before. In 1872, he and his growing family moved back to Pontoise, where he was visited by young artists looking for inspiration and advice, including Paul Cezanne (1839-1906) and Vincent Van Gogh (1853-1890). With prices rising at auction and the rich art critic Theodore Duret, the Comte de Brie, recommending his works, Pissarro's fortunes seemed to be looking up. Alas, it was to prove a false dawn. In April 1874, the Impressionists held their first public show. Pissarro's landscapes, along with all the others, were lambasted by the art critics, and sales (and prices) were very low. Days later, his 9-year old daughter died. As it happened he was the only Impressionist, along with Edgar Degas, to exhibit at all eight of the Impressionist exhibitions in Paris, before the group disbanded in 1886. Despite being a key figure in modern French painting, and being responsible for some of the greatest modern paintings, Pissarro always doubted his own artistic ability and never fully settled into a style with which he was entirely comfortable. He progressed from dark landscapes, to brighter Impressionism, toyed briefly with Neo-Impressionism (after meeting Georges Seurat) and then returned to Impressionism. He often chose high view points, painting a city landscape for example from a top window. His palette developed a chalky, pale tone, and he favoured green and blue hues. Notable works from his later period include: Self-Portrait (1873, Musee d'Orsay, Paris); The Washerwoman (1880, Metropolitan Museum of Art, New York); Young Peasant Girl Wearing a Hat (1881, National Gallery of Art, Washington DC); The Shepherdess (1881, Musee d'Orsay); The Church of St. Jacques at Dieppe (1901, Musee d'Orsay); and Red Roofs (1877, Musee d'Orsay). In 1893, when Pissarro was 61, Durand-Ruel organised a hugely successful one-man show of 46 of his works. This, and his growing reputation as one of the greatest modern artists, finally gave him the financial and artistic security for which he had been searching. Sadly, he was already suffering from a chronic eye infection that largely prevented him from painting outdoors. Because of this, he was forced to resort to painting landscapes from indoors. In 1893 and again in 1897 he booked hotel rooms in Paris from which he painted 24 urban landscapes of the city at different times of the day and in differing weather conditions. (Paintings which had a significant impact on the American Impressionist Childe Hassam.) 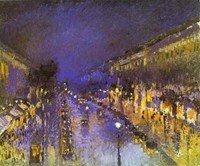 Examples include Boulevard Montmartre, Rainy Weather, Afternoon (1897, Private collection) and Boulevard Montmartre at Night (1897, National Gallery, London). In addition, during the 1890s he completed a series of river views around Rouen, as well as numerous works in the vicinity of Dieppe, Eragny, Le Havre and Paris. He continued to work in his studio, until his death in 1903 from blood poisoning, living long enough to witness the start of the Impressionists fame and influence around the world. He was survived by one daugher, Jeanne Pissarro, and through her a generation of other artists would be born. Lelia Pissarro, Henri Bonin-Pissarro (also known as BOPI) and Claude Bonin-Pissarro. By the turn of the century, Pissarro was acknowledged as one of the greatest French Impressionist painters. He was revered in particular by several major figures of Post-Impressionism, such as the exotic Paul Gauguin (1848-1903) and Paul Signac. However, his overall contribution to the history of art continued to be under-estimated for some time. Where Monet was a prolific practitioner of the Impressionist style, Pissarro was a key instigator of the Impressionist technique. During his 50-year career he produced more than 3,000 paintings in oils, tempera, pastels, watercolours and gouache, as well as several hundred fine art prints. Furthermore, not only had he contributed significantly to the theory of Impressionism, but also he had been a major organizer within the group and had managed to stay on friendly terms with difficult personalities like Degas, Cezanne and Gaugin. Although Pissarro never sold his paintings for much during his lifetime, today they fetch millions of dollars in art auctions. His works can be seen in many of the best art museums around the world. Here is a short list of selected paintings not cited above.  The Marne at Chennevieres (1864) National Gallery of Scotland.  The Quay Pothuis at Pontoise (1868) State Art Gallery, Mannheim.  A View from Louveciennes (1870) National Gallery, London.  Road in Louveciennes (1870) Mellon Collection.  Foxhill: Upper Norwood (1870) National Gallery, London.  Lower Norwood under Snow (1870) National Gallery, London.  Penge Station (1870) Courtauld Institute of Art, London.  Street in Upper Norwood (1871) Neue Pinakothek, Munich.  The Crossroads, Pontoise (1872) Carnegie Museum of Art, Pittsburgh.  Entrance to the Village of Voisins (1872) Musee d'Orsay, Paris.  The Haystack, Pontoise (1873) Durand-Ruel et Cie, Paris.  Self-Portrait (1873) Musee d'Orsay, Paris.  The Harvest at Montfoucault (1876) Musee d'Orsay, Paris.  Orchard in Pontoise (1877) Musee d'Orsay, Paris.  A Path Across the Fields (1879) Musee d'Orsay, Paris.  The Climbing Path l'Hermitage (1877) National Gallery, London.  Banks of the Oise, near Pontoise, Cloudy Weather (1878) Musee d'Orsay.  The Woodcutter (1879) Robert Homes a Court Collection, Perth.  Landscape at Chaponval (1880) Musee d'Orsay, Paris.  Peasants Resting (1881) Toledo Museum of Art, Ohio.  Peasant Girl Drinking her Coffee (1881) Art Institute of Chicago.  Woman in the Meadow at Eragny, Spring (1887) Musee d'Orsay.  Apple-Picking at Eragny-sur-Epte (1888) Dallas Museum of Art.  Boulevard Montmartre, Afternoon Sun (1897) Hermitage, St Petersburg.  L'Avenue de l'Opera, Snow, Morning (1898) Museum of Fine Arts Houston.  Tuileries Gardens, Rainy Weather (1899) Ashmolean Museum, Oxford, UK.  For more biographies of modern artists, see: Famous Painters.  For information about contemporary artists, see: Homepage.